People dance and cheer in Tahrir Square after former Egyptian President Mohamed Morsy was ousted from power. Egyptian investors are clearly relieved that the country's democratically elected president Mohamed Morsy has been ousted by the military. Egypt's main stock market index surged by more than 7% Thursday, the day after the military took control. The gains helped the index recover most of a massive 17% drop during June. Violent demonstrations had been ripping through the nation as protesters called on the defiant leader to step down. The military backed the opposition and gave Morsy 48-hours to "meet the demands of the people". When the deadline passed Wednesday, the military took over and handed power to interim president Adly Mansour. Investors are betting that the military's intervention to oust the country's leader will help restore stability to the region's most populous nation. "The ousting of Morsy from the Egyptian presidency has been received by the markets as a risk-on event," wrote FOREX.com's research director Kathleen Brooks in a note. Of course, it's not all smooth sailing from here. Egypt's military is now faced with the daunting task of holding democratic elections to find a new president, and the timetable for this could drag on. Morsy supporters are also fighting back and staging street demonstrations Friday. "In the coming weeks, a lot of effort will be focused on ... holding presidential and parliamentary elections, revising the constitution, and strengthening the country's institutions," explained Pimco's CEO Mohamed A. El-Erian, a leader in the global bond market. On Friday, Fitch Ratings downgraded Egypt's default ratings to B- from B, meaning it believes political instability threatens the country's economy and creditworthiness. U.S. President Barack Obama expressed deep concern on Wednesday about the political upheaval, calling for a quick return to civilian leadership. He also ordered a review of aid to the Middle East ally. 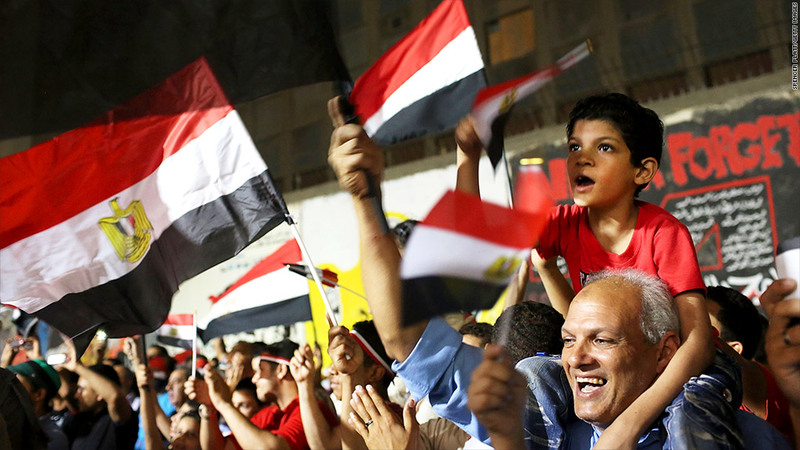 Related: What next for Egypt's entrepreneurs? Egypt is seen as a critical country for the global oil market, and oil prices touched a 2013 high Friday, driven up by anxiety over continuing violence. U.S. oil futures for the August contract rose as high as $102.44 a barrel, though the price eased in later trading. Egypt produces a negligible amount of oil. But the Suez Canal, which passes through the north African nation, is a major shipping route between the Mediterranean Sea and the Red Sea and Persian Gulf. Roughly four million barrels of oil come through the Suez Canal each day.